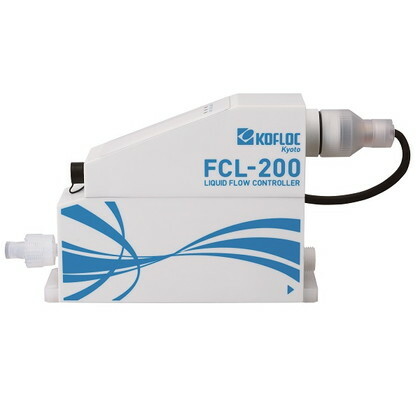 FCL-200 is a controller developed for liquid flow control having all of its areas in contact with liquid made of Teflon. This controller is most suitable for controlling semiconductor process fluid of ultrapure water and fluids in such fields as pharmaceutical and food industries. ・All areas in contact with liquid are made of Teflon, which enables constant flow control of clean fluid. ・The newly developed dedicated valve structure produces almost no particles. ・The high temperature type is capable of controlling fluids as high as 80℃. ・Digital control via RS232C is possible. This product is not designed for shutoff. If shutoff is required, install a dedicated shutoff valve before the controller. Install a filter before the controller to prevent intrusion of foreign matter. If the mixture of bubbles in the fluid being used exceeds 5%, the output flow rate accuracy may deteriorate. Exercise caution.